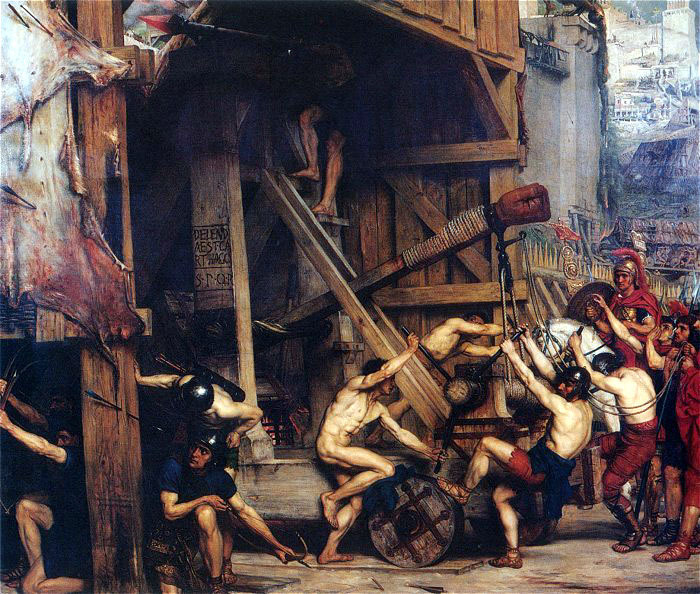 Catapulta, by Edward Poynter (1868). Siege engines such as this were employed by the Roman army during the siege. First, the name of the battle is NOT “Armageddon” or the “Battle of Armageddon”. The correct name for the battle is found in Revelation 16:14. It’s “the battle of that great day of God Almighty”. Some prophecy teachers place the battle in Israel’s largest Valley, which is 50 miles north of Jerusalem. According to scripture, the location of this battle in Hebrew is referred to as “Har-Mageddon/Megiddo” (Rev. 16:16). But the Hebrew word “har” means a mountain. Now isn’t a mountain the exact opposite in meaning from a valley? In Hebrew the “h” is silent, thus rendering the Greek word as “Armageddon”. This battle of Armageddon is but a part of the whole prophecy of the book of Revelation. According to the internal testimony of Revelation this whole prophecy were concerning “things which must shortly come to pass”; “at hand”; “things which must shortly be done” for “the time is at hand” (Rev. 1:1; 1:3, 22:6 and 22:10). Can you imagine living in one of the seven cities mentioned in the book of Revelation and reading John’s letter? These “things” were something that they could obey, heed and keep during their lifetime in the 1st century! In Revelation 22:10 John was directed not to seal up the prophecy: “And he saith unto me, Seal not the sayings of the prophecy of this book: for the time is at hand.” But sealing up is exactly what many modern day prophecy teachers do. In essence, they have sealed up Revelation for over nineteen centuries (and counting) by their system of postponement interpretation. But now, today, they want to unseal the book by claiming that near future events will finally occur to fulfill the prophecies of Revelation, including the “Battle of Armageddon.” Indeed, there’s ample evidence to suggest that the book of Revelation was written before the destruction of Jerusalem and the Temple in 70 A.D. The book of Revelation is a book filled with signs and symbols. It is full of what’s known as Biblical imagery and symbolism. Har-Magedon/Megiddo is a composite name and most likely also symbolic. Therefore, it’s not unreasonable to conclude that it also, is symbolic of a real battle. This is a rather boring mundane interpretation which certainly will not sell many books and DVDs! If we look back in history, we’ll find that multiple battles were fought during Biblical times at Megiddo. It was the site of two major ancient Israeli victories; of Barak over the Canaanites, and of Gideon over the Midianites. It was also the place where the armies of King Saul and King Josiah were defeated. The great military leader Napoleon Bonaparte conquered a portion of Palestine in 1799. Napoleon declared that Armageddon was the most natural battleground in the world. Church historian Eusebius records these events in his work “Ecclesiastical History”. In addition to the three (3) Roman Legions (the 5th, 10th, and 15th), other military contingents from the entire Roman world (oikumene) joined in the Roman-Judeo campaign. Eusebius records that over 1.1 million Jews died during this siege of Jerusalem. The Battle of Armageddon may also represent comparative imagery. A great slaughter once took place in the valley of Megiddo (2 Kings 9:27, Zech 12:11). Throughout ancient history, this valley was a favorite highway for invading armies and the scene of numerous famous battles. So much blood was shed in the valley of Jezreel or Megiddo that it became synonymous with slaughter, violence, and bloodshed. It is also a symbol of God’s judgment (Hosea 1:4-5). Have you ever heard the term “he has met his Waterloo?”. Well back in 1815, this small Belgium town was the scene of Napoleon’s final defeat. Now today we have the saying that someone has met their “Waterloo”. We don’t mean they have met the city of Waterloo in Europe. We mean, in a comparative way, that they have met a crushing defeat. May I suggest that Revelation uses the word Armageddon/Megiddo in this same way? Armageddon—The original of this word has been variously formed, and variously translated. It is ‏הר־מגדון‎ harmegiddon, “the mount of the assembly;” or ‏חרמה גדהון‎ chormah gedehon, “the destruction of their army;” or it is ‏הר־מגדו‎ harmegiddo, “Mount Megiddo,” the valley of which was remarkable for two great slaughters: one of the Israelites, 2 Kings 23:29, the other of the Canaanites, Judges 4:16; 5:19. But Mount Megiddo, that is Carmel, is the place, according to some, where these armies should be collected. But what is the battle of Armageddon? How ridiculous have been the conjectures of men relative to this point! Within the last twenty years this battle has been fought at various places, according to our purblind seers and self-inspired prophets! At one time it was Austerlitz, at another Moscow, at another Leipsic, and now Waterloo! And thus they have gone on, and will go on, confounding and being confounded. Adam Clarke believes that Revelation 16:16 was fulfilled during the two great Israelite slaughters: 2 Kings 23:29 and Judges 4:16. I detect a hint of sarcasm from Mr. Adam Clarke. He thinks all of the “conjectures” about the battle of Armageddon are “ridiculous.” He even refers to those who place the fulfillment of Revelation 16:16 with more modern battles as “purblind seers and self-inspired prophets”! I once believed, as many other Christians do, that Revelation 16:16 is yet to be fulfilled. However, both history and the Holy Scriptures testify otherwise. No, the battle of Armageddon does not involve nuclear weapons, fighter jets or chemical gas. Revelation 16:16 simply records one of the five major Biblical battles fought at the plains and hills of Megiddo. What I believe scripture reveals is that the battle of Armageddon referred to in Revelation is not about some great end time battle in our future. John was writing to first century Christians regarding the destruction of Jerusalem in 70 A.D. John used apocalyptic, symbolic language. The Jewish Christians of the first century were certainly aware that this valley of Megiddo had been the site of numerous slaughters and bloodshed in the past. Now, John, the Revelator is saying that Jerusalem, which sits on a mountain (Mt. Zion) will experience a similar slaughter in their immediate future. Zechariah the prophet also mentioned the future destruction of Jerusalem: “In that day shall there be a great mourning in Jerusalem, as the mourning of Hadadrimmon in the valley of Megiddon.” (Zech 12:11). John in Revelation was using Armageddon/Megiddo as a figure of speech to declare that Jerusalem would soon experience destruction just as Megiddo did in the past. I am fully aware of the dire condition that this world is presently in. But it is also true that the world has gone through many transitions and upheavals in the past. This includes two world wars during which many predicted that the “end of the world” had arrived. While it’s certainly possible that we are on the verge of World War III, I don’t believe that Revelation 16:16 predicts this war. I am comforted by the words of Isaiah when he said “of the increase of his government and peace there will be no end.” We have the assurance that the “knowledge of the glory of the Lord will cover the earth as the waters cover the sea!”. (Hab 2:14). Shemitah - Secret to America's Future?